Our Olathe location is at 12755 Mur-Len # B-S, Olathe, KS 66062. The Olathe center is located east of 1-35 at 127th Street and Mur-Ien Road in Devonshire Plaza. Our Olathe center serves the southwest portion of Johnson County including Olathe, Spring Hill, &Gardner. It is also the closest center for those clients t hat live in Miami County. The dedicated staff in Olathe work one on one with their clients to ensure rapid weight loss. Utilizing our individualized weight loss program, the staff focuses on personalizing each counseling session and encouraging the clients to stay on track to reach their goal. Losing weight can improve your health, self esteem and general well being. 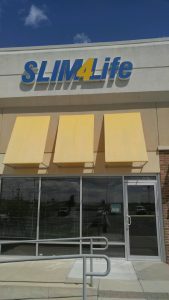 Our goal is for clients to lose weight quickly and to make a life style change so they can be Slim4Life. Make an appointment at our Olathe weight loss center today!